The bus drove by the large durian statue in the roundabout and I knew we had reached Kampot town. Durian is a common, yet peculiar smelling fruit and Kampot is one of its predominant producers. The three-hour bus ride was another test of our trust in Southeast Asian drivers and I sighed in relief stepping off the bus. We reached the riverfront area after a five minute walk and were welcomed by a wide tree-lined boulevard, mountain views and a cool breeze (which we had not felt in weeks). 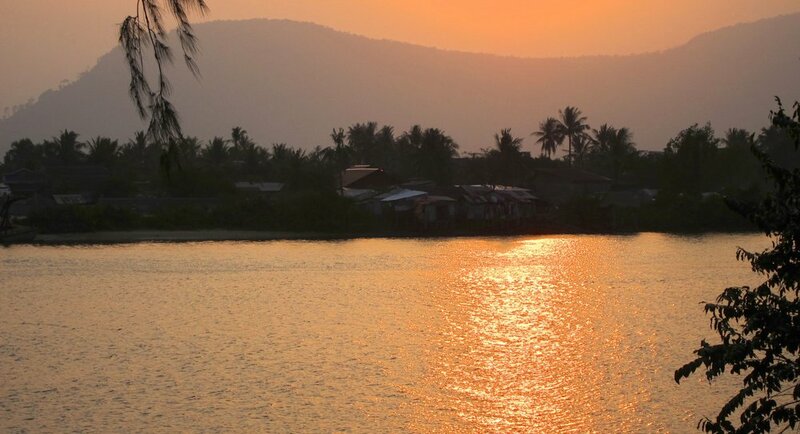 The sun was setting, I was breathing fresh air and I was already in love with Kampot. The sun setting over the Mekong River and distant mountains. 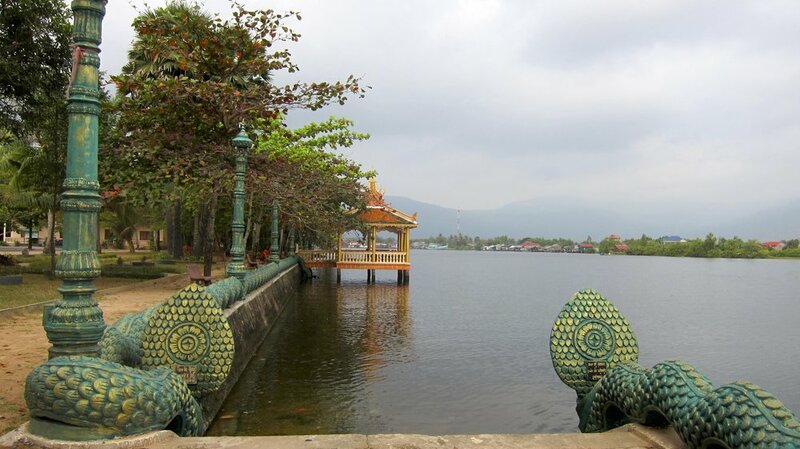 Kampot is a sleepy river town and the capital of the Kampot Province. During colonial days it was a retreat for the French and during the Khmer Rouge period, a stronghold for the Khmer Rouge army. This past weekend, it was our retreat. We were greeted by a staff of lovely young Cambodian women at our guesthouse who were amused by us sitting at the bar to eat our dinner rather than the patio tables like most guests. We practiced our Khmer language skills over an authentic wood-oven fired pizza and a bottle of wine. The first morning we were woken by the pack of dogs living next door, which is not uncommon in Cambodia. We took advantage of the early wake up call to walk a block to the riverfront to watch the fast and furious fish market. Fishing boats lining the riverfront in the early morning. Fish of all kind lined the sidewalks brought in from the daily catches along the river and the nearby Gulf of Thailand. The market started in the wee hours and packed up by 7am when the fisherman jumped back on board and headed out for another day on the water. In 15 minutes, you would hardly have known what had just occurred except for the random forgotten fish left to dry in the sun. 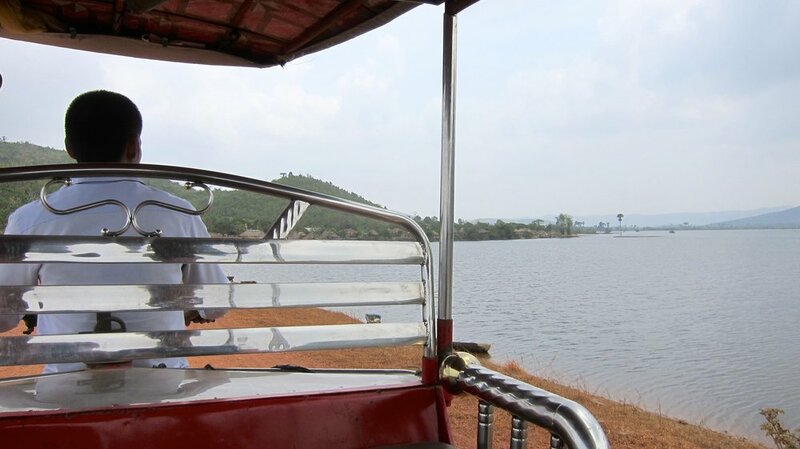 We had booked a guided bike tour of the area with Cambo-Ecotour, an eco-tourism service that contributes to improving community based natural resource management in Kampot. The manager, Mr. Leng, met us at our guesthouse with more bikes than people and helped us choose the right bike for each of us. Our guide, Karim, patiently waited as we adjusted seats, tried on helmets and reviewed the schedule for the day. It was an ambitious itinerary for hot weather - visit a Pagoda, a fishing village, salt fields, an island, bike back to town, have lunch, bike again to see Khmer noodles being made. I knew we'd never make it that long. The tour took us quickly out of town and onto the red dirts roads famous in Cambodia. People in stores, houses and on farms looked at us, shouted hello and genuinely smiled at the "barangs" (meaning a French person and used to reference any white foreigner in Cambodia) passing by on bikes. We have very warm people around us at work and in our lives in Phnom Penh, but this was a whole new level of hospitality. Wat Traoy Koh's riverside location. 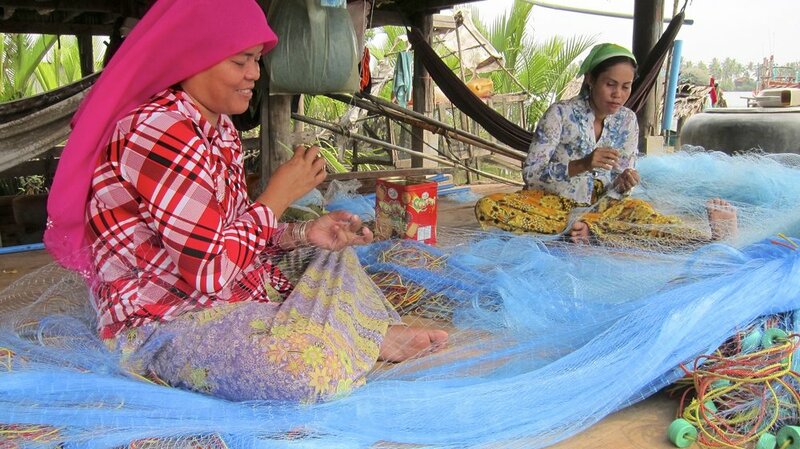 Women making fishing nets for their village's boats. Biking along salt fields, an island and the red dirt roads. As promised, we saw a beautiful riverside Pagoda, biked through a Muslim fishing village and interacted with a group of families, rode past wide open salt fields and along the path through Coconut Island out to the Gulf of Thailand. As we sat along the water on Coconut Island taking a break, the only sound was the ocean waves lapping against the rocks. It was our first encounter with quiet Cambodia and it was wonderful. Beat from an action-packed morning, we opted to finish up at lunch rather than bike the full day. I was ready for a shower and a nap. Mr. Leng came through on day two with a tuk tuk ride of our choosing. When Dave threw out the idea of finding a place to swim, the conversation between Mr. Leng and Karim flew back and forth. After some debate, we settled on visiting the Secret Lake and a Kampot pepper farm owned by a foreigner who would let people jump in his pool. This route was going to require masks for road dust and some patience as the tuk tuk maneuvered for an hour and a half along unpaved roads. Prepared for the bumpy, dusty mountain roads! We passed many more villages and lots of produce that looked healthy and flourishing - soybeans, corn and durian. More "hellos!" and "barangs!" followed us. The bumps and potholes were everywhere. 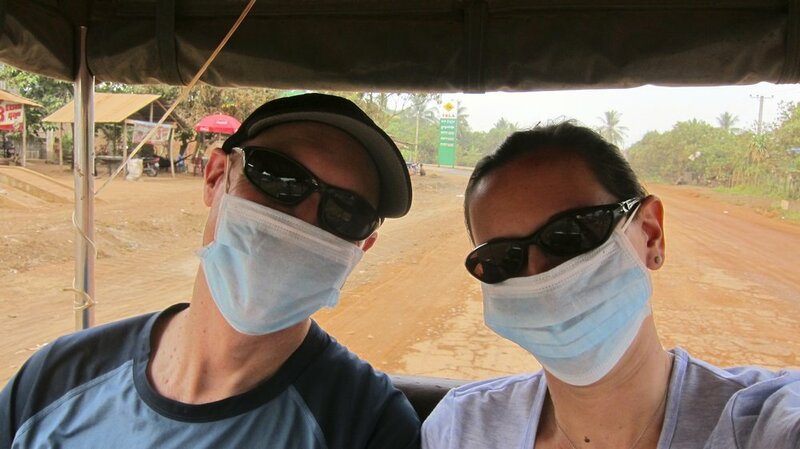 The tuk tuk made a few strange noises and we all took stock on any missing parts along the journey. Up the mountain side we passed the strikingly large Secret Lake, a calm and peaceful oasis tucked into the mountains. Karim looked back, "we'll come back here on the way down and I'll tell you why it's called Secret Lake." I was intrigued. We pulled up to Starling Farm and were surrounded by mango trees and pepper plants crawling high up bricks layered eight feet high. Kampot pepper was considered the finest in the world before the Khmer Rouge took over the hills surrounding the area and wiped away most of the production. Starling Farm's owner bought the property in 2001 to start his organic Kampot pepper farm and after purchasing it found out that it had only recently been vacated by the Khmer Rouge in 1999. Clearing the land has led to encounters with land mines and bomb shells dropped on the hillside by the U.S. during the Vietnam War. Stopping to smell (and taste) the pepper. The branches of green peppercorns hung off the plant branches and random bursts of red ripened peppers intermixed with their young counterparts. We made our way up to the beautiful villa on the hillside and met with the owner and his wife. 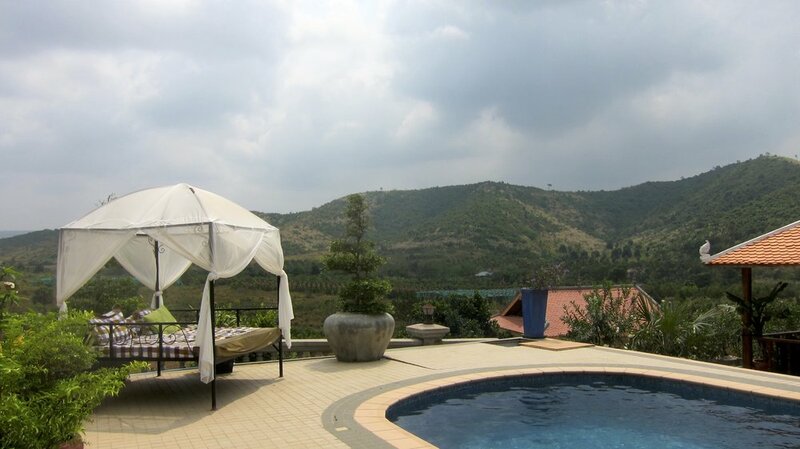 They built the house along with the pool for themselves, but quickly found that visitors were happy to hang out poolside and take in the fresh mountain air and vistas. They are planning a restaurant on site and a guesthouse for those looking for a really secluded Kampot retreat. The owner brought out the pepper grinders and I sampled white (very mild), red (spicy and sweet) and black (spicy!) pepper. You could have transported the entire scene to the Napa Valley and it would have made perfect sense. In fact, they are experimenting with some Sauvignon Blanc vines on the property. Could be the hills in California (or Cambodia). We were running out of time to make our afternoon bus back to Phnom Penh so we bought some pepper to take home and hopped back in the tuk tuk, headed to Secret Lake. It turns out that Secret Lake isn't named for its hidden location for tourists (believe me, if enough people knew about this place there would be a resort with kayaks, stand-up paddle boards and floating sun-bathing docks). According to our guide, back in the days of the Khmer Rouge, the lake was created by a dam that was built by local villagers. Many of the villagers were killed after they helped build the dam and buried underneath the dam or in the hillsides. One man who built the dam escaped and told people of the "secret" location of the dammed lake. Legend has it that some fishermen have collected human bones along with their daily catch. No wonder there isn't a resort here. Driving over the dam wondering what's below. Ah, Kampot. You stole our hearts with your sunsets, surprised us with your nature, saved our lungs with your fresh, cool breezes and left us wondering what we missed in just two short days. -The riverside is where most of the action happens. We were there on a very quiet weekend and it was extremely peaceful by the river. Happy hour 2-for-1 cocktails at Rikitikitavi on their second floor lounge is a must for sunset. -Support a local NGO and the deaf and disabled people who work at Epic Arts Cafe. The food is simple, but tasty and the handmade bags, jewelry and scarves almost put me over budget for our trip! -Mea Culpa guesthouse was a nice retreat on the south end of town, a block off the river. It's about a 15 minute walk from the bus station, but away from the busier part of town. A wood-fired oven turns out terrific bread and pizzas. Even if you don't stay there, head over for a real pizza! -The best maps of Kampot are the hand drawn collection on Rikitikitavi's site. -Take a tour and support the local economy. Our tours were $15 per person for a full day - a steal for the going rates of most tours in the world. -Giant Ibis bus company has two daily routes from Phnom Penh to Kampot and seems to have the nicest buses of the Cambodian companies.